Forgive me for my obsession with reproductive justice this week. I promise I'll get back to parenting book reviews and more general fundagelical (thanks for the new word, Jules!) critiques soon. Perry’s sister an advocate for surgical centers In case you were thinking that the part of the legislation that required abortions be performed at ambulatory surgical centers (ASC) was for the sake of the woman's health and safety, don't. It is for the financial benefit of his lobbyest/VP of United Surgical Partners International/ Board member of Texas Ambulatory Surgical Center Society, sister. ...Hannah got a tummy bug. Don't they look like twinners when they are passed out? Anyway, they are fully recovered and back to their general high-speed, high-volume lifestyles. Texas Abortion Bill: Is There a Medical Case for More Regulation of Outpatient Clinics? But surely the ASCs are safer. Actually, they are subject to much less oversight from the state than abortion clinics (shocking, no?). And ZERO medical associations support this requirement. So there is that. Most reproductive specialists agree, although they admit that there is little evidence to support the idea that ASCs provide higher quality of care over clinics. The American Congress of Obstetricians and Gynecologists (ACOG) released a statement in response to the Texas bill stating: "The bills would require physicians who perform abortions to have admitting privileges at a hospital within 30 miles, allowing abortions only in surgical clinics and setting a higher standard than for other procedures with similar low risk such as colonoscopy. The fact is that abortion is one of the safest medical procedures. The risk of complications from abortion is minimal, with less than 0.5% of abortions involving major complications." Not cool, crazy pants lady. Not cool. So I've Had a Few Abortions But maybe, like this lady with the pants up there, you think abortions are for whores. Who cares if you have to inconvenience the whores trying to get the procedure? Well, first off, you're a terrible person and you need to erase that word from your vocabulary. And second, you know who else needs medical abortions? Women who suffer a miscarriage. And as the author of this post, who has been in that position of needing an abortion procedure after miscarrying, points out: this legislation effectively gives you fewer rights as a pregnant person than the law grants you as a dead person. I read a perspective that I want to share with you. Let’s say you go into renal failure. For whatever reason, your kidneys are shot. Hey, we’re the same blood type, and I could give you a kidney to save your life. But I don’t have to. It’s my kidney, and I get to decide whether you can have it or not. If I choose to keep my kidney, you die. Corpses have the same rights – no matter how life saving their organs are, no living person has a right to those organs unless consent was given by the individual prior to his or her death. A fetus requires the mother to act as a host – putting her body and all of her organs on loan while he strives for viability. Without it, the fetus dies. Saying that a mother cannot choose whether to offer up her body as a life support system is saying that both that fetus and any corpse have more rights than a living, breathing woman. Let that settle in – Texas is pushing laws that strip living women of rights that we respectfully give to her corpse. She has more rights over her own body dead than alive. 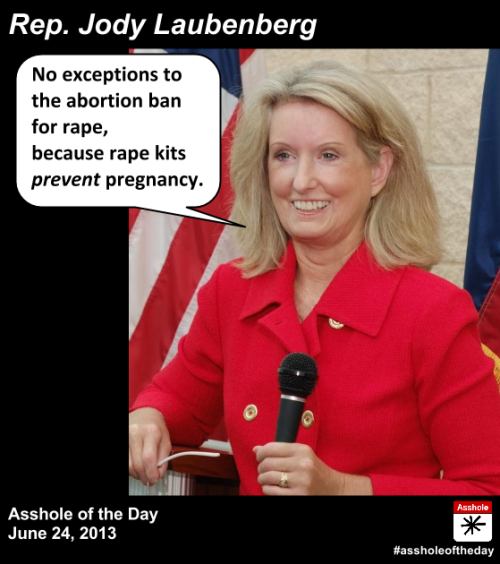 Meet Jodie Laubenberg, The Local Lawmaker Behind Texas’ Controversial Anti-Abortion Bill And if you saw any of the debate, you saw Jodie Laubenberg talk about the (preborn) babies!! Won't somebody please think of the (preborn) babies! Except here is the thing, not that long ago she argued to deny care/funding to these very (preborn) babies because, you know, "They’re not born yet.” Sooooo, a fetus is a person when it is politically expedient. Gotcha, GOP. You stay classy. It’s already harder to get an abortion than it is to get a gun, but Laubenberg wants to keep furthering the divide. As just one of many pro-gun advocates in the Texas House, she recently sponsored a bill that would allow firearm and ammunition manufacturers operating inside Texas to exempt themselves from federal gun laws. Oh man, yesterday on twitter during the legislative hearing it was like where fundagelical garbage aphorisms go to die. It was like, no matter what you say to them or what research you show them, they are like, GOD! Absolute truth! baby killing! AAAAAAAHhhhh. the only thing that made it easier was that I had a great name for them. So I mean, seriously. Have you ever stopped to try and figure out how this ultra-narrow minded way of thinking holds so much sway over people...? And how it just won't go away? Is it stubborness? Pride? Fear? What are they protecting, anyway? Besides their own egos, to presume they (old, narrow-minded privileged white men) know what's best for women? I guess I can answer my own question here if you change the terms from women't reproductive rights to, say, civil rights and racism. I just can't fathom what it's like to be *that* narrow-minded, to be *that* black-and-white...to never consider other options about anything, ever. To never consider the shades of grey, either because one won't, or one can't. and I sort of loved it because the absolute truth part of her religious upbringing was what ultimately brought her to atheism. I found that kind of awesome.